Ashlee Simpson‘s new engagement bling from her fiance, the socially-conscious rocker-boy Pete Wentz, is reportedly not only big and shiny, but also conflict-free. The Fall Out Boy bassist has revealed that the diamond engagement ring he placed on Ashlee’s finger earlier this month is not what is often called a “blood diamond”, but instead has conflict-free origins. Conflict diamonds are often mined in war zones under human rights violating conditions, most often in Africa, and sold to finance insurgency and warlord activity. 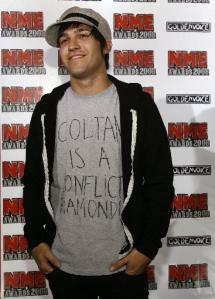 Wentz also sported a tee emblazoned with “Coltan is a conflict diamond!” to this week’s 2008 NME Awards, where he talked about his views on the dirty sparklers. “It’s something I care about,” he told People magazine. Coltan is a metallic ore often associated with it’s exportation which is used to finance war in the Congo, where it is mined. Coltan is used in consumer electronics, such as cell phones and computers. The couple will reportedly tie the knot in Southern California next month. Kelli Shields is an Ecorazzi contributor and the Major Gifts Associate for the Center for Biological Diversity.